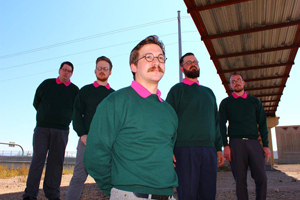 They call themselves ‘The world’s only Nedal band’, themed after the nerdy Ned Flanders from the television show, The Simpsons. Formed in Phoenix, Arizona in 2015, the 5 lads with the pseudonyms, Head Ned, Red Ned, Cred Ned, Dead Ned and Bled Ned, became a huge success before even playing their first show. The band had nearly 30K followers on Facebook with just a 4-song-demo and a few press photos! The band is reminiscent of early DEVO, with their quirky lyrics and comedic showmanship. This is not just a gimmick, as they are all obviously quite seasoned musicians. It is hard to find any information and background about the players behind the Ned Flanders green sweaters and mustaches, but given their talent, I would guess that they were music majors that stumbled upon a late night beer pong idea that none would realize would ignite the popularity it’s achieving. In 2016, the band released its debut album, Howdilly Dooddilly. It features a 13-track catalogue filled with Flanderisms, such as "Flanderdoodles", "Donut Hell", and "Godspeed Little Doodle". Their first video, "White Wine Spritzer" has had over 21K views. Check it out on KNAC.COM right HERE. Despite the veneer, the songs are imaginative and hold up on their own. The show is one of the most entertaining I’ve ever seen. So in the words of Flanders, “Spend less time on your back, and more time on your knees,” and check these guys out. Hidley Ho!